Aggelos, literally meaning messenger, are a gothic and doom metal band from Columbia that take on a dark and heavy atmosphere that also interweaves with a traditional classical structuring. This sort of intertwining of doom, gothic, and classical intrigued me immediately. It has been quite a while since I’ve paid much attention to gothic metal. The only recent memory I have was about three years ago when I just beginning to write for Metal Reviews and had the opportunity to review Darkest White from gothic metal veterans Tristania. 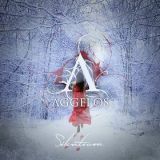 Jumping into Silentium, the sophomore album from Aggelos, felt needed after a long absence from traversing through the deep dark depths that I had been missing from gothic metal. The introductory track is a slow and creepy start to this gothic journey. Once the heavy guitars make an appearance, it’s obvious that Silentium has a thirst for darkness. Higuera Seca that follows brings out a more upbeat feel, mixing well with doom and Goth they immediately set forth. Vocals go back and forth between harsh growls to female vocals that let give off a haunting operatic feel. Sententia heightens the energy of the band quite a bit, driving out an epic sound. The spoken portions of the song here may feel a bit skip worthy, but interestingly the band uses lyrics that bounce back and forth between three languages, Greek, Hebrew, and Latin. There’s no doubt Aggelos are able to deliver a hefty punch of metal when needed. Viventem can hammer down an earthquake of heavy riffing that easily created soreness in my neck quickly. A nice break occurs with acoustic guitars and female vocals that shows that this band has great song writing ability, and is not afraid of clashing their classical style with a heavy storm of metal. Though Siltentium may be a bit short, Aggelos’ style of doom, goth, and classical is complex, punishing, and most of all, dark.